He was not overstating. While modern oceanic concrete structures crumble within decades, 2,000-year-old Roman piers and breakwaters still remain to this day, and are stronger today than when they were first built. University of Utah Geologist Marie Jackson studies the microscale structures and minerals of Roman concrete as she would a volcanic rock. She and her colleagues have discovered that seawater filtering through the concrete results in the growth of interlocking minerals that provide the additional concrete cohesion. The research findings are published in American Mineralogist. Romans created concrete by blending volcanic ash with seawater and lime to make a mortar, and then adding into that mortar pieces of volcanic rock, the “aggregate” in the concrete. The combination of water, ash and quicklime produces what is known as a pozzolanic reaction, named after the city of Pozzuoli in the Bay of Naples. The Romans may have acquired the idea for this mixture from naturally cemented volcanic ash deposits called tuff that are typically found in the area, as Pliny described. The conglomerate-like concrete was used in a number of architectural structures, including the Trajan’s Markets and Pantheon in Rome. Huge marine structures protected harbors from the ocean and served as broad anchorages for warehouses and ships. Modern Portland cement concrete also uses rock aggregate, but with a vital difference: the gravel particles and sand are intended to be inert. Any reaction with the cement paste could result in the formation of gels that expand and crack the concrete. This alkali-silica reaction occurs throughout the world and it’s one of the main causes of destruction of Portland cement concrete structures. Jackson’s interest in Roman concrete started with a sabbatical year in Rome. She initially studied tuffs and then examined volcanic ash deposits, soon becoming captivated with their roles in producing the extraordinary durability of Roman concrete. Together with colleagues, Jackson started exploring the factors that made architectural concrete in Rome so strong. One factor, she says, is that the mineral intergrowths between the aggregate and the mortar prevent cracks from expanding, while the surfaces of nonreactive aggregates in Portland cement only help cracks spread further. 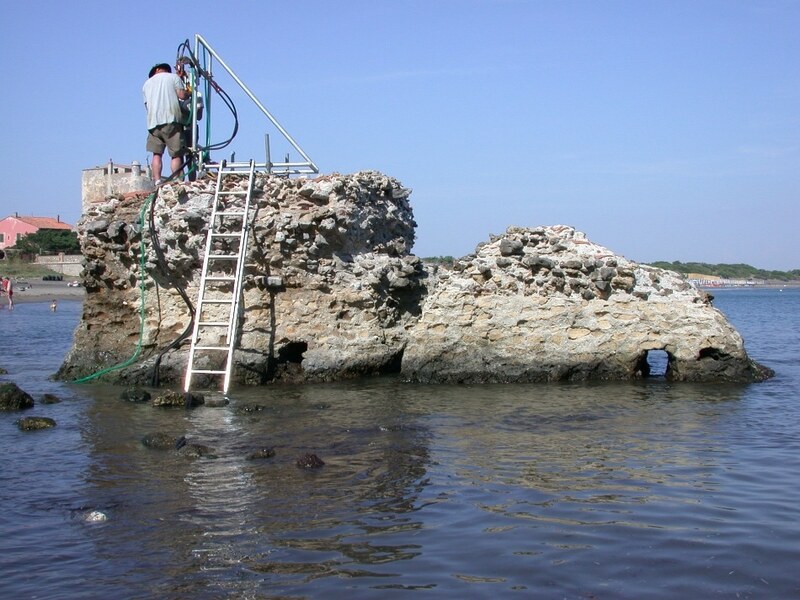 In another research of drill cores of Roman harbor concrete gathered by the ROMACONS project in 2002-2009, Jackson and colleagues discovered an extremely rare mineral, aluminous tobermorite (Al-tobermorite) in the marine mortar. The mineral crystals developed in lime particles through pozzolanic reaction at slightly elevated temperatures. The presence of Al-tobermorite surprised Jackson. “It’s very difficult to make,” she says of the mineral. Synthesizing it in the laboratory demands high temperatures and results in only small amounts. For the new study, Jackson and other Researchers returned to the ROMACONS drill cores, investigating them with a range of techniques, including microfluorescence and microdiffraction analyzes at the Advanced Light Source beamline 12.3.2 at Lawrence Berkeley National Laboratory. They found that Al-tobermorite and an associated zeolite mineral, phillipsite, formed in pumice particles and pores in the cementing matrix. From earlier research, the team knew that the pozzolanic curing process of Roman concrete was momentary. Something else must have caused the minerals to form at low temperature long after the concrete had hardened. No one has produced tobermorite at 20 degrees Celsius. Oh — except the Romans!... As geologists, we know that rocks change. Change is a constant for earth materials. So how does change influence the durability of Roman structures? The team concluded that when seawater permeated through the concrete in breakwaters and in piers, it dissolved parts of the volcanic ash and allowed new minerals to form from the extremely alkaline leached fluids, mainly Al-tobermorite and phillipsite. This Al-tobermorite has silica-rich compositions, similar to crystals that develop in volcanic rocks. The crystals have platy shapes that strengthen the cementing matrix. The interlocking plates boost the concrete’s resistance to brittle fracture. Given the durability benefits of Roman concrete, why is it not used more frequently, especially since manufacturing of Portland cement produces considerable carbon dioxide emissions? “The recipe was completely lost,” Jackson says. She has comprehensively studied ancient Roman texts, but has not yet uncovered the precise techniques for mixing the marine mortar, to completely recreate the concrete. She is currently working with Geological Engineer Tom Adams to prepare a replacement recipe, however, using materials from the Western U.S. The seawater used in her experiments was collected by Jackson herself from the Berkeley, California, marina. Roman concrete requires time to develop strength from seawater, and features less compressive strength than regular Portland cement. For those reasons, it is doubtful that Roman concrete could become widespread, but could be beneficial in specific contexts. Jackson recently weighed in on a planned tidal lagoon to be constructed in Swansea, UK, to harness tidal power. The lagoon, she says, would have to operate for 120 years to recover the costs incurred to construct it. “You can imagine that, with the way we build now, it would be a mass of corroding steel by that time.” A Roman concrete prototype, in contrast, could stay intact for centuries. Jackson says that while Researchers have answered a number of questions regarding the mortar of the concrete, the long-term chemical reactions in the aggregate materials are yet to be explored. She intends to continue the research work of Pliny and other Roman Scholars who worked diligently to discover the mysteries of their concrete. The Romans were concerned with this. If we’re going to build in the sea, we should be concerned with it too.